You had the perfect corner exit and now your front wheel is hovering an inch above the track surface. You tuck in further to get out of the wind and keep it pinned wide open through the line for a new personal best laptime. You never once thought about your gear. You had better things to concentrate on; the perfect line, braking points, apexing and throttle control to name a few. 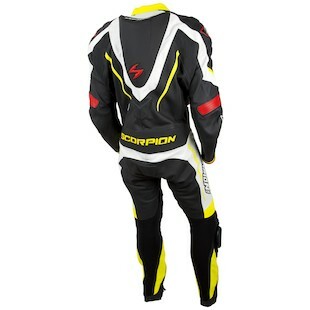 That is the beauty of the Scorpion Podium Race Suit. It packs a huge punch in the safety department so you don’t have to worry about that while you’ve got other things to worry about. The protection in all of the impact points; the elbows, knees and shoulders, is(are?) all CE-Rated SAS-Tec armor and there is even available spine protector from SAS-Tec as well. Even the speed hump is made out of a bioelastan anti-shock material. In addition to all this high-tech armor, you’ve also got additional padding throughout the torso, thighs, shoulders and even over your tailbone. There’s plenty of abrasion resistance to keep you covered as well. You’ve got 1.2-1.4mm top-grain Monaco cowhide for starters. 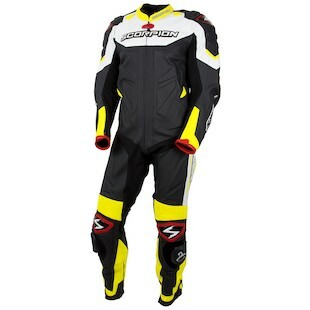 On the exterior of the suit, you have molded protectors at the shoulders and knees. The knee sliders themselves are included with the suit and feature Scorpion’s Stinger Logo and should you want to incorporate your Leatt Neck Brace, go ahead. The Podium is constructed for that as well. It also has quite a few comfort features built in. When a suit is uncomfortable, you may end up concentrating on where it is bunching or possibly where there is not enough stretch, limiting your movement. There are stretch panels in all of the non-impact zones including the sleeves, underarms, inseam and calves. In addition to these, You have accordion leather stretch panels at the impact points. For airflow, you have perforations in the leather in the front and back of your torso as well as in the thighs. The speed hump’s anti-shock material also flows air directly to the rider. Even with all this airflow, the rider can still get sweaty. That’s where the KwikWick II removable, washable liner comes into play. It is antimicrobial and wicks away sweat to keep you clean and comfy. So go ahead. Concentrate on the fast-approaching turn 1. Nail your braking point, slam the apex and throttle-on as early as possible. You’re on pace for another fastest lap. Go set it.